Dr. Rajkumar Chakraborty, Associate Professor of Physics (WBES) had his graduation from Presidency College, Calcutta with Honours in Physics, post graduation from Calcutta University and Ph.D. from Jadavpur University. 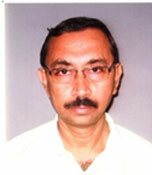 He has more than 24 years of teaching experience in different degree colleges. At present he is teaching Engineering Physics in GCECT. His current research interest is in electrical transport mechanism in composites and nano-composites.